Can sleep tech help a stressed-out insomniac understand her sleep patterns, chill out before bed, and get a good night’s kip? Wearable-gadget guinea pig and stressed sleeper Becca loves to discover tech that helps us feel good and perform at our best. The S+ Sensor by Resmed stands apart from the sleep tech bunch because, well, it literally stands apart from the rest. Sitting by my bed, it analysed my movements and breathing using radio waves. This was more appealing than trackers I had to wear or lie on. I didn’t worry once about the S+ tracking my sleep and, unsurprisingly, that resulted in deeper rest. But accuracy didn’t suffer because it was near me, not on me. Through a quilt and pyjamas it produced detailed graphs of my sleep patterns. Seeing all of that data broken down was fascinating, but became a little overwhelming over time without practical recommendations. The S+ also had settings to lull me off to sleep with breathing exercises, as well as nice sounds to wake me up in the morning, which was much better than hitting the snooze button a hundred times. Next up I tried the Emfit QS, which looked rather clinical but stayed hidden under my mattress. Once there, I forgot about it because it automatically tracks sleep and analyses heart rate, breathing and movement. Like the S+ Sensor, it’s mind-blowingly detailed. But the data wears thin after a week or so, especially when I wasn’t sleeping well and a graph couldn’t tell me why. It’s more useful if you’re hell-bent on fixing a problem, like waking up in the night or struggling to get to sleep, and have access to an expert to chat with. There are so many wrist-bounded activity trackers on the market that keep tabs on sleep. But the Fitbit Alta HR is one of the best thanks to its heart-rate monitor and new ‘sleep stages’ feature. The results weren’t as detailed as the others, but ideal for increased awareness – not long-term insomniacs. Interestingly, I found it became the only graph I checked after a few weeks because it told me what I needed to know without bombarding me with stats. It turns out even a self-confessed quantified nerd gets stressed out by data sometimes. Thanks to the millions of light-colour combinations and soothing sounds, the Nox Music Smart Sleep Light has become my new bedtime and productivity BFF. I use it for bright, white light during the day alongside music and then soothing warm light on a night with ‘snowstorm’ sounds. 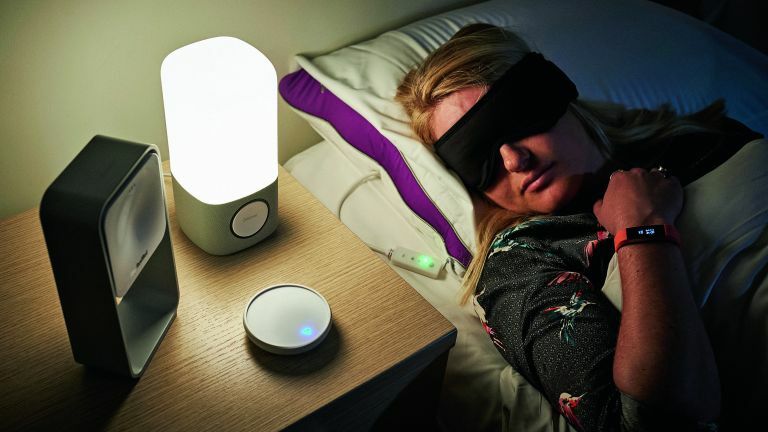 The lamp is great solo but also works with an app, which analyses sleep from your phone so it can deliver sleep stage specific music and sounds, like red before bed and a twinkly alarm in the morning. Although I’m not a fan of having my phone under my pillow, the app and lamp combo worked particularly well. I went to sleep quicker and woke up feeling less angry at everything because there was no alarm to scowl at and it had woken me up at the optimum time in my sleep cycle. The Zeeq Smart Pillow can do a lot of things, but my favourite feature was the way it played sleepy sounds as I tried to get to sleep – directly to my ears. The problem? My partner could hear all of them too. Losing sleep over losing sleep? An expert tells us sleep tech can be great for curious types, but not so wonderful for worriers. I asked Kathryn Pinkham, Dreams sleep expert and founder of The Insomnia Clinic, about the upsides and downsides of sleep tracking. Its tracking and wake-up smarts were highly accurate, but I just couldn’t get my head around lying on technology. This is probably a personal bugbear, but definitely seemed to affect how I slept. The most unusual of the bunch, the Thync Relax Pro, sends electrical signals to your brain. It’s for people with anxiety, the irony being that as someone with anxiety, self-electrocution sounded terrifying. With research to back up its claims and lots of panicked false starts, I gave it a go. Thync says you’ll need a few weeks to notice any difference, and I’ve felt calmer and slept better. But that could be psychosomatic. Using the Thync Relax Pro with both sleep and mood tracking over the course of six months or so would be fascinating. Finally, I tried the Dodow. It’s the most simple of the bunch, but if you have trouble getting to sleep rather than staying asleep, it might be the most effective. It projects light into your room that you breathe along with. I can do that with an app, but this way I dozed off more easily. I can’t imagine it’ll have a huge effect on those who suffer from long-term insomnia, but it’s a nice, modern take on a night light. Having loads of tech on me and around me in bed often made me feel stressed-out. Ah, the paradox of losing sleep over tracking sleep! That could just be me, but as these products are marketed at worriers, I doubt my experience is unique. The tech that sat by me was the most appealing, like the S+ sensor. But, as with most wearables or health tech, it’s going to be down to personal choice and subjective goals. Overall, I found the sleepy sounds soothing, the data fascinating and more awareness about my sleep empowering. But if you’re really struggling, you probably need to talk to a specialist and not a Fitbit.